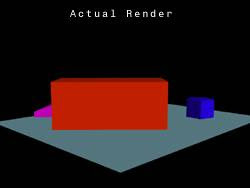 But in the practical view looks like the bottom figure, we just need to render three objects: red, purple, and blue one. The green and yellow one are hidden. In this condition, we can adopt GPU hardware support. Direct3D provides Occlusion Query to calculate number of pixel visible. If the number is zero, meaning it is fully occluded, else is greater than zero the pixel is visible by the viewer. Retrieve occlusion query data. 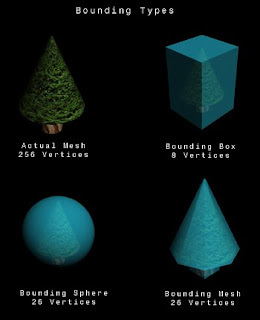 If the pixels visible are greater than zero, the object should be rendered. Otherwise, the object should be occluded from rendering. In the first step, we need to decide the bounding mesh. Use bounding box? sphere?...The suit way is using lower vertex count mesh to instead of bounding box or sphere. Bounding sphere may have the same vertex count with bounding mesh, but it can't approximate like bounding mesh, use bounding mesh can effectively test the occlusion, and well enough accurate. render the bounding mesh first to make sure the scene is present in the Z buffer. 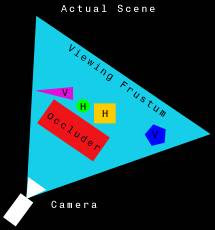 At the second step, occlusion query to determine each object's visibility status. If the query is zero pixel, the object is exclude from the final draw, else the object is include in the render list. Adopt much smaller surface (320 pixels to 240 pixels) is used to improve performance.